Clarified Butter Chocolate Chip Cookies were the result of an attempt to clone Otis Spunkmeyer Chocolate Chip Cookies. I’ll probably never make an exact clone of the Otis Spunkmeyer Cookies because they seem to use some kind of special baking fat available only to the food industry, but the Clarified Butter Chocolate Chip Cookies were a pretty good stand-in. They have crispy edges and chewy centers and an overall handsome appearance. And yes, they do have a buttery flavor. That being said, if you don’t feel like dealing with clarified butter and are okay with using shortening, just follow the recipe below but use 1/3 cup shortening and 1/3 cup butter. The texture of the cookies is actually better with shortening, but I know not everyone likes to use it. Note: For a good tutorial on clarified butter, check out my Michael Chu’s blog, Cooking for Engineers. 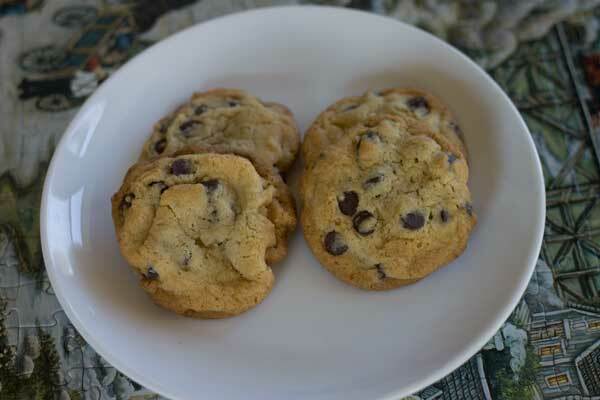 Chocolate chip cookies with soft centers and crisp edges. Preheat oven to 375 degrees F. Have ready a couple of ungreased cookie sheets. In a mixing bowl, using an electric mixer, beat together the clarified butter (or shortening and regular butter until creamy. Add both sugars and continue beat just until blended. Add egg and vanilla and beat just until blended. By hand, stir in the flour mixture. When blended, stir in the chocolate chips and nuts (if using). Scoop up measuring tablespoons of dough and arrange on the baking sheets spacing about 2 ½ inches apart. Bake on ungreased cookie sheets for 10-14 minutes or until lightly brown around the edges. Let cool on baking sheets for five minutes, then transfer to a wire rack. **I've become really loyal to Rumford brand. It doesn't have the same metallic aftertaste as some of the others. About the clarified butter, I'm not an expert and recommend you read a tutorial if you've never done it. For this recipe, you’ll need to start with a stick (1/2 cup 4 ounces) of unsalted butter to make 1/3 cup (2.3 ounces) clarified. Melt the butter over medium heat until it milk solids come to the top. Reduce heat. Being careful not to let the butter brown, skim the white foam off the top with a spoon. Pour the clear butter into a bowl and let it cool completely. If you’ve accidentally browned it you can pour it through a sieve or let it drip through a coffee filter (or cheesecloth if you have one) to trap the brown particles. Fascinating. I just came across a recipe for ccc’s on the clbb that had a good amount of coriander in it–I am thinking clarified butter plus coriander and call it an Indian chocolate chip cookie! Those cookies look perfect-nice golden brown color. I am looking for a ginger cookies that is crispy on the outside and chewy on the inside. I’ll check out your posts! I like Cooking for Engineers, I use their banana bread recipe. Clarified butter is also call ghee, is that right? Maybe Otis Spunkmeyer also uses that bakery flavoring? I’ve seen it at the King Arthur store online … buttery sweet dough flavor. Even though you couldn’t replicate Otis Spunkmeyer, it sounds like you created a great recipe! I hope you are enjoying your holiday season!